I am starting a new disc golf website called http://createflight.com. And a new blog at http://createflight.com/blog/. Very windy day at the Gentlemen's Club Classic Amateur Disc Golf Tournament. At the Gentleman's Club Classic warm up tournament I shot a +5. 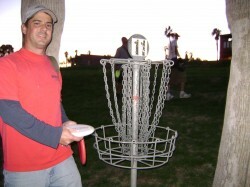 I did shoot for the wrong basket on 5 that caused me a couple strokes. Played the layout again on Sunday and shot a +4. Didn't even know what I was shooting until hole 17. My son wanted to play a "real" round so it was a bit frustrating trying to help him out. He was only +50!! Not bad for a 7 year old! The Disc golf on the new Playstation Move looks pretty cool. Better than the one on Tiger Woods 11. Those are tough holes. Nice! I birdied holes 4 and 12 at Peccole Ranch today practicing. Two tough holes to birdie I tell ya. I really like the Pro Katana, have a worn one and a new one, all below 170g. Very controlled driver, like understable discs. Nice ace Phil. 2 is pretty crowded with trees!!! I got the Tiger Woods 11 for the WII. It has disc golf in the party games section that can be played online. So if anyone else gets a copy and can play online, lets play(ball golf or disc golf). Went by Peccole Ranch today and they were thinning out the trees around hole 11. Wonder how many discs they are finding up there? Hey, does anybody have an update on Jeff Flores's condition? Last I heard anything was at the Worlds Biggest. Thanks Phil. It was a nice view watching it go in.. Very stable driver. Will fight through any wind. solid stable putter, has the bead on the bottom of the disc, beaded aviar.